The Canon Hollywood Professional Technology and Support Center invites you to attend an exclusive one-day intensive production workshop with Jem Schofield of theC47 featuring the new EOS C300 Mark II digital cinema camera. In this in-depth session, Jem will dive into planning, lighting, and shooting with the EOS C300 Mark II for real-world productions. Focus will be on setting up and shooting with the camera both in run and gun, small to no crew location and studio based configurations. 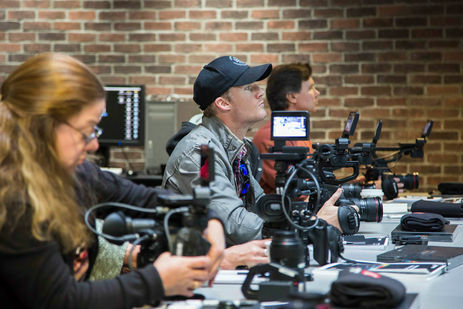 This workshop will dig into lighting and shooting HD & 4K productions as well as specifics to the EOS C300 Mark II such as exposure recommendations when shooting log, production to post-production Log and LUT workflows, using the extensive AF features of the EOS C300 Mark II, and other tips and tricks. The EOS C300 Mark II will be a part of the workshop and there will be multiple cameras on hand; so don’t expect lots of presentation slides. This will be a hands-on workshop and the focus will be on giving you the tools and knowledge that will help you be more successful in future projects. While much of it will be up to you, the workshop will go over successful actions and also will include hands-on demonstrations of how to tackle productions to consistently achieve great results. The workshop will be delivered in a conversational style that will allow Jem to work effectively with the attendees operating as his crew, while still teaching process and craft. Exactly like being on an actual, working set! It will also include an actor for documentary/corporate interview and narrative style lighting set ups. Target Audience: The workshop is intended for producers, DPs, camera operators and aspiring filmmakers interested in understanding and using the EOS C300 Mark II and other Cinema EOS cameras in production especially in small to no crew scenarios. This is a Canon Live Learning Event. *The Future: focused on emerging technologies and trends and how they impact the industry. In addition to the general sessions, P|PW offers multi-day, certification and hands-on training that allows attendees to deep dive into platforms such as Adobe After Effects, Adobe Premiere Pro and Apple Final Cut Pro X. Audio Network has joined forces with PactUS to bring the television industry together during Realscreen Summit in Washington, D.C. next week for an evening of curation featuring David Lyle’s favorite whiskies and Audio Network’s top tracks. Make sure you stop by! Blackmagic Design announced that DaVinci Resolve Studio, Blackmagic Cinema Cameras and Pocket Cinema Cameras were used on more than 35 films at the 2016 Sundance Film Festival. Our first meeting of the year was chock full of entertainment, great energy and enthusiasm. We started the evening with a case study of “Dinner with the Alchemist” from filmmaker Kevin Good who chose the LAPPG as his first audience to share his trailer with. The group was very impressed and loved learning about the incredibly creative process Kevin took with the visual effects for this indie feature. They especially enjoyed the before and afters Kevin showed with the still she found to create backgrounds that were very impressive and which would have been out of the budget for this film. By the end of his presentation, the audience was inspired to find creative resources for their own projects. 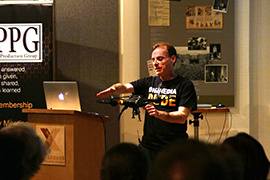 After the break, Marcelo Lewin, aka DigiMedia Dude “flew” back to the LAPPG to introduce us to the world of Drones. In pure Digimedia Dude style were were taken through a very thorough presentation of what drones we should by, what we need to know about drones, how to fly them and what safety precautions we should take. Members got to give his flight simulator a try and a few lucky ones even got to fly a real one right in our meeting!